In June and July 2013, we went on a sunbathing expedition to the Karavshin Valley with our main goal to gain a remarkable sun tan with which to impress the Cumbrian ladies back at home. 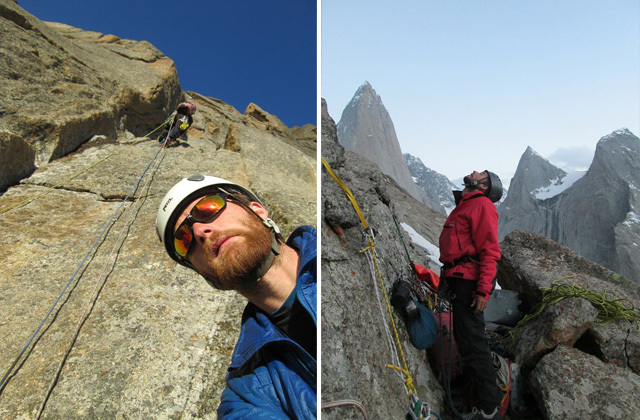 Our secondary goal was to climb a new route on the west face of Kotina. Standing at an altitude of 4520 meters and boasting a staggering 1700 meter near-vertical rock wall to its summit, Kotina would be the biggest climb we had ever done. In fact, Kotina’s west face was approximately 30 times bigger than the average multi-pitch route on our local Langdale crags. We arrived in the city of Osh where we wandered around the enormous outdoor market in a dazed state of sleep-deprived exhaustion and bought a 2-month supply of food for our adventure in the mountains. Not speaking a single word of the Kyrgyz or Russian language, we felt a little useless, stupid and typically British. At the roads end we met a local shepherd who agreed to walk into the mountains with us, using his donkeys to transport our equipment. For 2 days we walked under clear blue skies, our pale foreheads burning in the unfamiliarly intense sun, until we reached our base camp in the Kara Su valley. We were surprised to see that we were the first climbers to arrive that season. On our first day in the mountains, an enormous storm covered our camp in a fresh layer of snow which confirmed our suspicions that we had arrived too early in the season. The snow melted the following day and a rogue herd of cows invaded our camp and ate our only bar of soap. Fortunately, a catastrophic disaster was averted because we had accidentally left our entire food supply in the tent, unbeknown to the mischievous cows. Without a watch or anything capable of informing us of the time or date, we made a sundial by wedging a stick in a hole in a rock and used the back of a Snickers box to make a calendar. We had forgotten to bring a frying pan, but luckily found one hanging in a tree, obviously left by a previous expedition. We spied an unclimbed line which appeared to follow crack systems and dihedrals directly up the center of the west face of Kotina. With no topo or route information, we took all our equipment up and began climbing, expecting any level of difficulty. Nobody knew exactly where we had gone or when we would return. With no phone or any form of communication, an extraordinary feeling of isolation and freedom was cast upon us. We were forced to adopt a ‘no mistake’, full commitment mentality. 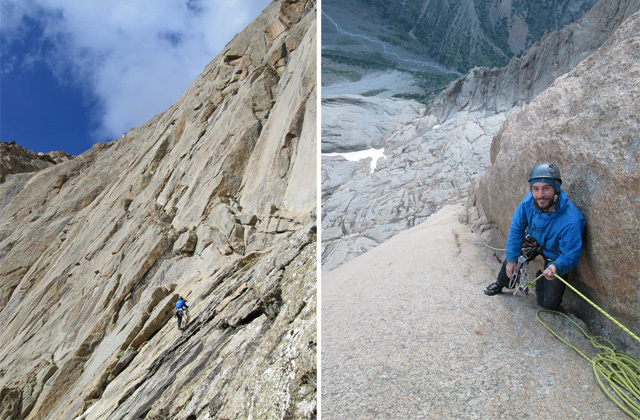 The route began with 900 meters of gentle slab climbing to a large ledge system, where we established a portaledge camp. An enormous storm engulfed us at that point, and so we waited for 3 days until we ran out of food and were forced to descend to base camp to re-supply. We were amazed to see that a small, and very hungry dog was waiting for us at base camp. We could only assume that he had got lost from the local shepherds miles further down the valley, and had found shelter at our tent. We named him Dave. We cooked some pasta and gave a healthy portion to Dave, but he wouldn’t eat it. This was a testament to how poor our food was if a starving dog wouldn’t eat it. After a couple more days, the storm cleared and we re-climbed the 900 meter slab to our portaledge camp, relieved to see it hadn’t been washed away in the storm. From there, we continued directly up the center of the impressive 800 meter vertical headwall, following a series of outstanding crack and corner systems which were linked together by cool face moves. We reached the summit during a fantastic electrical storm which made our beard hair stand straight, and our equipment buzz with electrical charge. We climbed the whole route ground up, onsight and free. We named the route “My Little Winkie”. We descended the route, leaving nut, thread and piton anchors which can be safely used by subsequent parties. We returned to the luscious green meadows of our base camp. During the days that followed, only the occasional thin cloud floated through the crystal clear, high-mountain air, which briefly obscured the suns rays from bronzing our skin. After a month alone in the mountains ofKyrgyzstan, and no contact with the outside world, we began to think there had been a major world tragedy which would explain why we were the only climbers in the valley. Shortly thereafter, a few groups of climbers turned up with satellite phones and computers. This gave them access to weather updates and helicopter rescue within a few hours, and an entirely different experience to ours. We repeated a couple of established routes before it was inevitably time to leave our mountain paradise. It was an unforgettable experience and we are very thankful to you for helping us.